Are Pressure Cookers Safe to Use? A pressure cooker is a cooking utensil that relies on the build up of steam and, as the name suggests, pressure to cook food. In slightly more technical terms, a pressure cooker sort of simulates the effect of long braising process, cooking through wet and dry heat, in a much shorter time. Pressure cooking is an incredibly versatile method for cooking food, since any food that is able to be cooked in steam or water-based liquids can easily be cooked in a pressure cooker. Through its versatility, ease of use and short cooking time, pressure cookers are a staple kitchen equipment in most houses through the world. Though many cook still shy away from using pressure cookers for that association of pressure cookers being something our grandparents would use and would, inevitably, blow up. Today, let’s take a thorough look at how safe a modern pressure cooker is and is it worth it to even use one. We hope that by the end of this article, you will have sufficient knowledge to make an informed decision about the safety of modern pressure cookers. With that, let’s get into it. The very first pressure cooker was invented by a French physicist Denis Papin, who is better known for his extensive studies on steam. The first pressure cooker was called the steam digester and was claimed to reduce the cooking time for food. It worked by trapping steam in an airtight cooker. Papin realized that by trapping steam in a fixed space, it would increase the pressure inside the cooker, which would consequently raise the temperature inside the cooker (shout out to Guy Lussac’s Law and basic thermodynamics). Papin also knew that raising the temperature in such way would increase the cooking speed since as a general rule, every 10 degree increase in a chemical reaction results in the reaction speed increasing becoming twice the original speed. And since cooking is basically a chemical reaction, Papin used all this knowledge, which might seem obvious to us, to invent a revolutionary cooking utensil to cook food faster. The first pressure cooker to see widespread use were the “old type” pressure cooker with weighted or “jiggler” valves. These are usually the pressure cookers that most people concerned about the safety of pressure cookers would remember. One reason that people remember this type of pressure cooker might be because of the incessant noise it used to produce, courtesy of its weighted “jiggler” valve. These pressure cookers only offered one pressure level that couldn’t be adjusted and only a single steam vent to release extra pressure. These pressure cookers had a host of problems which to be fair, made it a slight hazard to operate. These problems included, the weighted valve breaking, replacement valve not being the correct weight, gasket breaking, opening the pressure cooker while pressure was still inside leading to forceful openings and spillage of food stuff and etc. While modern pressure cookers are based on this first generation of pressure cookers, they have introduced a lot of changes in how the pressure cooker works as you’ll see. The second generation of the pressure cooker was often operated by a hidden spring-loaded valve. This valve was usually covered in proprietary mechanisms but the basic fundamental operation was a spring-loaded valve. Usually either of two types of pressure cookers were found at that time. One type did not release any pressure during the cooking process, known as non-venting pressure cooker. They would come with an indicator to show the internal pressure level and would only release steam when opened. Sometimes they would actually open if the heat source was not reduced upon reaching the necessary internal pressure for cooking. The second type would often have a dial on its lid which could be adjusted by cooks to change the pressure setting or to even release steam from inside the pressure cooker. These were known as venting pressure cookers. The dial would change the spring tension leading to change in pressure setting or even release of the same. This type of pressure cooker would have been the most common one in most households around a decade ago. The most modern iteration of the pressure cooker is the electric pressure cooker or the countertop pressure cooker. While basically still borrowing the principles from the earlier two iterations, it is very different from its predecessors. The electric pressure cooker includes an electric heat source which would regulate automatically to maintain the necessary internal pressure. Usually most electric cookers have spring-loaded valves. Almost all electric pressure cooker have a built in timer. Depending on when the electric pressure cooker was manufactured, the timer might be mechanical, or it might be a digital timer with controller, or it might be a digital timer with smart programming. A few of these modern electric pressure cookers can do a variety of other cooking tasks with their various modes and such. Now let’s talk about the safety features that one would find in most modern pressure cookers in the market. With an extensive list of safety features, we shall start with the most obvious one; the pressure release valves. In terms of safety features, most modern pressure cookers are much safer than the first generation of pressure cookers. In earlier pressure cookers, food particle or residue would get stuck in the primary valve and/or the steam vent. In modern pressure cooker, if the steam vent is blocked, it will trigger additional safety features. Reputed manufacturers make sure that their pressure cooker have multiple safety features to prevent any sort of explosive opening. One of these features is to forcefully eject the blocking food residue or particle, which creates a very loud noise. Though this situation will rarely arise, if one cleans the pressure cooker according to the manufacturer’s instructions which tries to ensure that no food particle or residue remains lodged in the safety valve. Another way to make sure that there is never any food particle or residue lodged in the valves is to ensure that you never overfill your pressure cooker with either food or liquid. Most modern pressure cookers also have multiple setting to ensure that pressure never exceeds than the amount that is essentially required for the cooking process. And with multiple fail safes, and at least two to three redundant safety valves, the chances of an excess build-up of steam is astronomically low. A good pressure cooker has a lid with the locking device situated on the top of the cover. Though there are many different types of modern locking methods when it comes to modern pressure cooker, the interlocking lid system is the safest system for the lid safety of a pressure cooker. The best locking systems will prevent even the user from opening the lid if there is still internal pressure inside the pressure cooker. The lid will only be allowed to be released when the internal pressure is equal to the atmospheric pressure outside the pressure cooker, making it safe to open. Most modern pressure cookers also prevent any build-up of pressure if the lid is not locked in currently to prevent any failure. 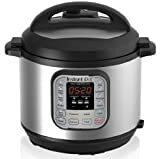 With most modern pressure cookers, especially electric pressure cookers, you can select the amount of pressure you want your food to be cooked. Whether that would be manually, preset pressure settings, or smart programming controls depends on the particular type and model of the pressure cooker. When selecting a pressure setting, a pressure cooker will ensure that it maintains the internal pressure as indicated by you and release any excess pressure built up by venting steam. This ensure that there is never any excess pressure inside the pressure cooker for any reason. While not something that every pressure cooker will have, a feature that a majority of modern pressure cookers will have are the presence of indicators. A pressure indicator is usually a standard feature that shows the presence or absence of any pressure inside the pressure cooker. This ensures that you don’t accidentally try to open the pressure cooker lid with pressure still inside. A temperature measuring indicator is less prevalent than the pressure indicators but still a feature that is commonly found in reputed pressure cooker products. The rarest of these indicators is a pressure gauge which is only found on the most expensive models of pressure cookers. A pressure gauge accurately lets one know the exact amount of pressure inside the pressure cooker vessel. In most electric pressure cooker and some other modern pressure cookers, the bottom of the inner pot has a built in thermostat to regulate the internal temperature of the pressure cooker. This stops the food from being burnt. And with most modern pressure cookers having an over-temperature release valve, alongside an over-pressure release vent, this means that your pressure cooker will never heat up excessively. Almost all pressure cookers, apart from a few wing-bolt models, have a gasket, or a sealing ring, to ensure that when the lid is closed it forms a gas tight seal that stops and traps all steam inside the pressure cooker. In modern pressure cooker, as an added safety measure if the pressure inside the vessel reaches the highest safe limit, the gasket is pushed upwards through a release aperture system. This ensures that the gas tight seal is broken and the excess pressure can escape maintaining safe levels of pressure and temperature inside the vessel. If during the cooking process there is a leak for any reason, modern electric pressure cookers will automatically slow down the heat source to prevent the food from burning due to lack of sufficient pressure inside the vessel. The pressure cookers usually detect this by measuring the heating time needed to vent out all the air inside the vessel to create a proper vacuum. In a similar vein, if for some reason there is not sufficient moisture or liquid inside the pressure cooker, a modern electric pressure cooker will stop heating once it reaches the maximum safe limit. This is due to a lack of liquid or water, there will be very little steam being produced and instead there would be just excess heat being transferred. Almost all modern pressure cookers have handles made out of hard rubber or plastic, like Bakelite, to prevent the handle from heating up and which can resist being heated up to high temperatures. These handles are also longer than older pressure cookers so that they remain relatively cool and allow the users to transfer the pressure cooker without too much of a hassle. Most countries have strict regulations considering the minimum safety standards required for selling or manufacturing a pressure cooker. Since a failure can be catastrophic, most standards regulate that the pressure cooker be over-engineered in terms of safety so that in no reasonable circumstance that a pressure cooker fail in any way. In the European Union, pressure cooker safety standards are governed by the Pressure Equipment Directive (PED) to ensure the safety regulations and standards are conformed with. In the UK, instead of the PED they have enacted the Pressure Equipment Regulations (PER) which is functionally the same as the PED. For USA, the most relevant safety certification is the UL 136 from the international and independent organisation of safety analysts, Underwriters Laboratories. A pressure cooker is a completely safe kitchen utensil that most cooks can easily use in their daily cooking life to save on time and effort. While there are some things that one must ensure to avoid doing, like overfilling or not replacing broken parts, most modern pressure cooker are so dedicated to safety that they have multiple layers of redundant safety feature to prevent any accident from occurring. Always check the manufacturer’s instructions regarding how to properly take care of your pressure cooker and how to utilize as well. If you’re still concerned about the safety about the traditional pressure cooker, we’d suggest the more modern electric pressure cookers since they have additional safety features when compared to the standard pressure cooker. We hope that in the light of all this information being provided, one would realize that modern pressure cookers are safe utensils and start adopting them and availing the benefits of using them in their daily lives. Check out Guide or Visit our Contact Us Page and send your query.